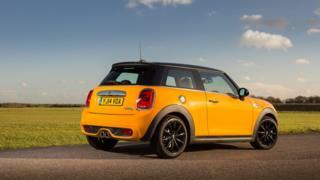 The carmaker said the model would go into production in 2019, with Oxford the main "production location" for the Mini three-door model. BMW said it had "neither sought nor received" any reassurances from the UK on post-Brexit trading arrangements. Last year, the government faced questions about the "support and assurances" given to Nissan before the company announced that new versions of its Qashqai and X-Trail would be made in the UK. UK Business Secretary Greg Clark hailed BMW's announcement as a "vote of confidence" in government plans to make Britain "the go-to place in the world for the next generation of vehicles". On Monday, he set out plans to invest in development of battery technology in the UK. Mr Clark met BMW's head of sales and marketing, Ian Robertson, at the company's headquarters in Munich in January and March this year. The two also held meetings at Westminster in March and June. David Bailey, professor of industry at Aston University, said the true test of the global car industry's desire to invest in the UK would come next year: "I don't think it [BMW's decision] tells us much about Brexit and the form of trade barriers we may face in the future. "The big decisions will be about future models [which would have redesigned bodies], both at Mini and at companies like Vauxhall when they announce their new models in the next couple of years." BMW says the economic case for building the electric mini in Oxford is compelling, and it's easy to see why. This is not a brand new car, redesigned from the ground up. It's a Mini, a 3-door hatchback, which will in many ways be identical to the cars already being built at the Cowley plant. The electric bit - the drivetrain, which includes the motor, gearbox and battery pack - will be assembled in Germany, and fixed to the rest of the car in the factory. So it makes sense to build this model at the same factory as the majority of existing Mini production. There is no need for a new factory or production line, meaning the size of the investment will be relatively small by auto-industry standards - in "the tens of millions", BMW says. There is a potential spanner in the works - the new car is due to go into production in 2019, months after the UK leaves the EU. With drivetrains being imported into the UK and many completed cars exported back to Europe, there's a risk costs could rise sharply if tariffs are introduced on cross-channel trade. But the company insists it can only make decisions based on the current economic realities. There has been no "special deal" done with the British government, it says - and nor has it asked for one. The German carmaker said the Mini announcement was part of a plan for electrified vehicles to account for between 15-25% of its sales by 2025. The electric Mini will be based on the company's 3-door hatchback model. However, BMW has yet to release pictures of a prototype vehicle. Unite assistant general secretary Tony Burke said the announcement was a "big vote of confidence" in BMW's UK workforce. He told the BBC that there had been "patient discussions behind the scenes" to secure the electric Mini. Although there was no news about extra jobs, Mr Burke said the new Mini would "certainly underpin existing employment". BMW currently makes electric motors and batteries for all of its electric cars at two factories in Germany, at Dingolfing and Landshut. Electric car development has been boosted by a series of announcements in recent months. The first phase of a £246m investment by the UK government into battery technology was launched on Monday. Earlier this month, Volvo became the first traditional car maker to commit to including an electric motor in all of its new models from 2019. US firm Tesla's first mass-market electric car, the Model 3, is expected to be unveiled on Friday at a handover party for 30 customers, before production is ramped up. And the first vehicle manufacturing facility to be built in Britain for more than a decade opened in Ansty, Coventry, in March to produce a new electric London black taxi.